1. Halicyclamine B: Bioorg. Med. Chem. Lett. 29 (1), 8-10 (2019). 2. Strongylophorines: Bioorg. Med. Chem. Lett. 25 (13), 2650-2653 (2015). 3. neo-Kauluamine: J. Nat. Prod. 77 (6), 1536-1540 (2014). 4. 1-Hydroxyethylhalenaquinone: Heterocycles 89 (11), 2605-2610 (2014). 5. Salsolinol: Chem. Pharm. Bull. 59 (2), 287-290 (2011). 6. Aaptamine: Bioorg. Med. Chem. Lett. 20 (11), 3341-3343 (2010). 7. Lignans from Anemarrhenae Rizoma: Biol. Pharm. Bull. 28 (9), 1798-1800 (2005). 8. Secomycalolide A: Mar. Drugs 3 (2), 29-35 (2005). 9. Agosterol C: J. Nat. Prod. 66 (12), 1578-1581(2003). 1. Hyrtioreticulin A: Bioorg. Med. Chem. 20 (14), 4437-4442 (2012). 2. Himeic acid A: Bioorg. Med. Chem. Lett. 15 (1), 191-194 (2005). 1. 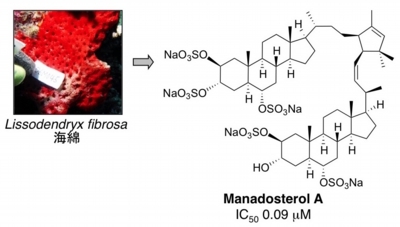 Manadosterol A: J. Nat. Prod. 75 (8), 1495-1499 (2012). 2. Leucettamol A: Bioorg. Med. Chem. Lett. 18 (24), 6319-6320 (2008). 1. Niphateolide A: Tetrahedron 71 (38), 6956-6960 (2015). 2. Siladenoserinol A: Org. Lett. 15 (2), 322-325 (2013). 3. Hexylitaconic acid: Bioorg. Med. Chem. Lett. 16 (1), 69-71 (2006). 1. 2-Geranyl-2′,3,4,4′-tetrahydroxydihydrochalcone: J. Nat. Med. 72 (3), 632-640 (2018). 2. Sulawesins A: J. Nat. Prod. 80 (7), 2045-2050 (2017). 3. Petroquinone A: Tetrahedron 72 (35), 5530-5540 (2016). 4. Spongiacidin C: Bioorg. Med. Chem. Lett. 23 (13), 3884-3886 (2013). 1. 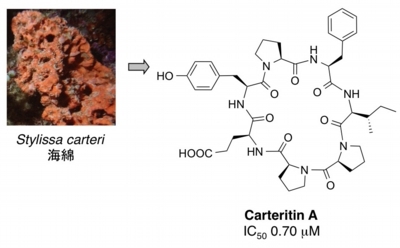 Tsukamoto, S. Search for inhibitors of the ubiquitin-proteasome system from natural sources for cancer therapy. Chem. Pharm. Bull. 64 (2), 112-118 (2016). 2. 塚本佐知子、横沢英良． ユビキチン修飾系を標的とする創薬シーズの探索. 実験医学増刊「シグナル伝達　研究最前線2012」、編集：井上純一郎、武川睦寛、徳永文稔、今井浩三、羊土社、30 (5), 171-176 (2012). 3. 塚本佐知子、横沢英良． ユビキチン依存的タンパク質分解系を標的とする創薬. 化学と生物、 49 (11), 745-754 (2011). 4. 塚本佐知子、横沢英良．タンパク質分解の不思議：ユビキチン‐プロテアソームシステムの仕組みと創薬．愛知学院大学薬学会誌 3, 1-18 (2010). 5. 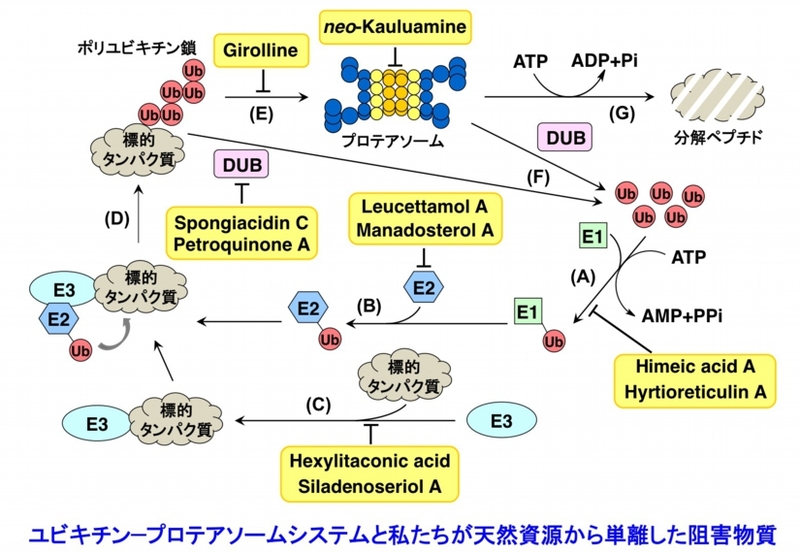 Tsukamoto Tsukamoto, S., Yokosawa, H. Inhibition of the Ubiquitin-proteasome System by Natural Products for Cancer Therapy. Planta Med. 76 (11), 1064-1074 (2010). 6. Tsukamoto, S., Yokosawa, H. Targeting the proteasome-mediated proteolytic pathway, Expert Opin. Ther. Targets 13 (5), 605-621 (2009). 7. 塚本佐知子. ユビキチンリガーゼを分子標的とする新規抗がん剤の海洋生物からの探索. 薬学研究の進歩研究成果報告集、24, 45-51 (2008). 8. 塚本佐知子、横沢英良. 展開するプロテアソーム阻害剤研究. 実験医学増刊「細胞内の輪廻転生　タンパク質の分解機構」、編集：田中啓二、羊土社、26, 122-127 (2008). 9. Tsukamoto, S. The Search for Inhibitors of the Ubiquitin-proteasome System from Natural Resources for Drug Development. J. Nat. Med. 60 (4), 273-278 (2006). 10. Tsukamoto, S., Yokosawa, H. Natural Products Inhibiting the Ubiquitin-proteasome Proteolytic Pathway, a Target for Drug Development. Curr. Med. Chem. 13 (7), 745-754 (2006). 11. 塚本佐知子、横沢英良. ユビキチン-プロテアソームシステムをターゲットとする天然物化学・創薬化学の新しい展開. 有機合成化学協会誌、62, 968-976 (2004). 1. Carteritin A: Tetrahedron Lett. 57 (11), 1285-1288 (2016). 2. Naamidines H & I: J. Nat. Prod. 70 (10), 1658-21660 (2007). 1. Girolline: Biol. Pharm. Bull. 27 (5), 691-701 (2004). 1. Ceylonins A: J. Nat. Prod. 80 (1), 90-95 (2017). 2. (-)-6-epi-Notoamide T: Bioorg. Med. Chem. Lett. 27 (22), 4975-4978 (2017). 3. Ceylonamides A: J. Nat. Prod. 79 (8), 1922-1928 (2016). 1. Manadodioxane E: J. Nat. Med. 69 (4), 595-600 (2015). 2. Spironaamidine: Tetrahedron Lett. 52 (41), 5342-5344 (2011).